Driveway gates have always been popular items for Torchcraft customers. 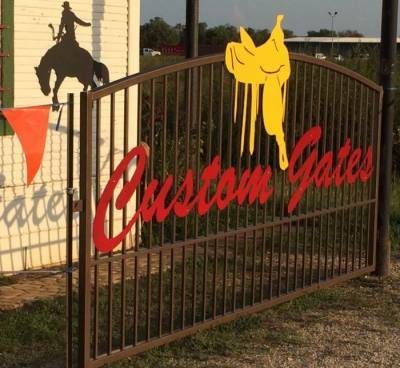 Just as a ranch entrance sign displays the owner's interest or theme, a driveway gate can do the same, but on a smaller and more affordable scale. Weather you have a pre-existing gate and you would like to add some metal art or you need Torchcraft to build a gate and incorporate artwork and wording into the gate, Torchcraft can craft the perfect piece to grace your driveway. This is a great way to display an interest of the family such as family pets, wildlife, sports, landscape or just a pretty design. Be sure to work in your address for easy visibility. Paint on a curb or small numbers on a mailbox can be hard to find and read. Torchcraft can overlay reflective vinyl lettering over the metal letters to help your address numbers really stand out. Day or night. Contact Jerry at Torchcraft to get your driveway gate project started!